Please forgive me for barely managing to eke out a hurried “hello” this morning when I dropped off Aubrey at preschool. I’m sorry I couldn’t make eye contact with you, or ask how your weekend was. I apologize for not lingering an extra minute at the sign-in book like I usually do, hoping my presence will be inconspicuous as I watch in awe while you fluently navigate a dozen pint-size pupils to their respective seats in circle time (but not before ensuring that 24 hands are scrubbed clean of bacteria and boogers, and all personal treasures from home are properly deposited into the share basket). I’m not sure if you noticed that I couldn’t even make it out of your door this morning before the tears began to well up in my eyes. I certainly wasn’t expecting to be leveled by such an onslaught of emotion. Yes, of course I realized it was the last day of preschool; we had been talking about it at home for weeks. Aubrey had picked out a parting gift: a sweet-smelling lavender candle that we hoped you’d love. Together, we had hand written a thank-you card, elaborating on what a wonderful teacher you have been this year. I watched my daughter carefully form the letters to “Mrs. Kloos” and “Love, Aubrey” all by herself … every last one of which she mastered by tracing at your tiny tables. 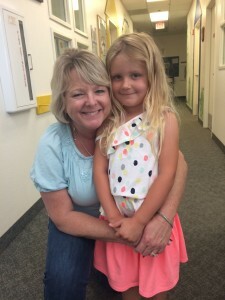 We had even registered — with excitement — for transitional kindergarten at our neighborhood elementary, my little girl already giddy with anticipation about learning how to read. 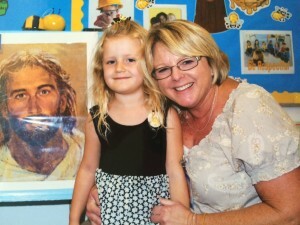 But then in your classroom this morning, surrounded by giant cutouts of letters A through Z, and finger-painted masterpieces adorning every wall, and a slew of developmental aids cleverly disguised as toys, and the simplest of Bible verses displayed at a 4-year-old’s view … it suddenly hit me that today is my daughter’s last day of preschool. My last child’s last day. There will never again be drop off at Lambs of Faith preschool. There will never again be your affectionate embrace and bright smile to greet Aubrey each morning. (You were always smiling. We loved that.) I will never again deliver my daughter to this warm, welcoming, safe, spiritual space where I can walk out the door and without a second thought, relinquish my inherent protective-mom tendencies. For three hours a day, twice a week, I have recklessly abandoned my vigilance, checked my anxiety at the door. Not once did I worry about Aubrey ingesting a thumb tack or choking on a grape. Never did I wonder if she was scared or lonely or missing me. Never did she cling to me, beg me not to leave, or express a single negative feeling about you or her preschool. She loved every minute of it! And she loved you! And now, as I prepare to retrieve her from your classroom in a few short hours on this very last day, I am not at all sure that I will be able to hold it together. There are so many things I want to say, and yet I wonder if my voice will be capable of enunciating (without cracking). The words “thank you” seem so incredibly underwhelming considering all you have done for her — and me — this year. I know by the growth charts on your wall that Aubrey sprouted two and a half inches and gained 5 pounds over the course of the past 9 months. But she grew in so many other ways — so many more important ways — that just can’t be measured. Like the truly magical manner in which you helped my hesitant daughter embrace the social experience, a virtual fairy princess granting a mother’s unspoken wish. You made this an infinitely safe place for a child — who had never been cared for by anyone other than a family member — to explore, make new friends and take her first strides toward independence. You didn’t simply teach Aubrey letter and number recognition; you nurtured her to have an assertive voice and confidence among her peers. You allowed her to operate at her own pace; from initially standing back and observing her classmates, to eventually joining in, to ultimately choosing her own pursuits. Before she started coming to your classroom, she would sprint to my side at the local park if another child even approached the equipment she was playing on. Now she walks up to entire groups of 3-foot strangers and seamlessly joins in without skipping a beat. You helped Aubrey to master motor skills both gross and fine — from hopping on one foot to holding a pencil. You taught her to fold her hands and bow her head before snack time. You taught her all the words to a Hawaiian prayer that she recites at the dinner table as if she is a native Pacific Islander, despite the fact that the rest of the family has no idea what she is saying. Oh, and you made her entire week when you assigned her the much-coveted task of Line Leader! And on other occasions, it’s what you didn’t do that was so powerful. 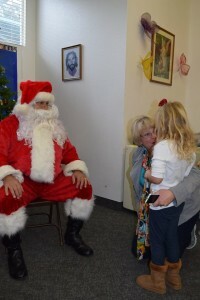 Like the time just before Christmas break, when Santa made a surprise visit to preschool. As I frantically scrolled through the school’s near-real-time Facebook feed — lit up like a Christmas tree with photos of every child joyfully sitting on his lap — I found myself dreading Aubrey’s reaction. But then I came to the picture of her. She was not forcibly restrained atop Santa’s leg with tears streaming down her cheeks, as I had imagined (an expression that had been captured in four years’ worth of Santa mall photos). Instead, she stood cautiously but calmly a good 5 feet away, holding up a stoic hand to greet the bearded icon from her own established safe zone. And there you were right beside her, crouched down on your knees, a protective arm around Aubrey’s back for support. I never got to tell you thank you for putting my timid girl at ease, for being the one to communicate to Santa that her wish was to find “a pink barn with three stalls” under the tree on Christmas morning. Thank you for neither insisting that Aubrey do something that frightened her, nor shaming her for being the only student to resist Jolly Old Saint Nick. Thank you for being my daughter’s cheerleader, her protector, her instructor, her moral compass, her confidante, her voice when she couldn’t speak, her hand cleaner and booger wiper, when I couldn’t be. Thank you for helping her learn how to stand up for herself, and how to brush herself off when she fell down. Thank you for helping her begin to understand that there is far more importance to Christmas than presents, and that Easter has a deeper meaning than chocolate eggs and bunnies. Thank you, again, for smiling so much. It was the sheer magnitude of this gratitude that sucker-punched me in the gut as I signed in Aubrey this morning, on this very last day of preschool. I guess I just don’t know the proper way to say goodbye to someone who has so graciously completed so many acts of kindness where my child is concerned, who has done so much to prepare her socially and emotionally for her future school experiences. Would it be awkward if I asked if we could take you to lunch sometime? Would it seem strange if I sent you a Facebook friend request? What if you don’t have a personal Facebook account; could we drop you an email to check in and see how you’re doing? The fact of the matter is, I don’t think Aubrey is ready to say goodbye to you yet. And quite frankly, neither am I.
Aubrey is blessed to have two parents who are so involved with guiding her toward becoming a responsible young lady!